They're not wrong, but students aren't entirely without recourse. As an NPR investigation in 2014 showed us, the average amount students have spent on textbooks plateaued in 2002. Students are now paying only $320 per semester for their textbooks, and they've found smart ways to keep the cost down. Students are more selective in which textbooks they buy, and they're more inclined to buy online so they can get the lowest price. If the textbook isn't strictly needed for the class then students tend not to buy them, and they're also more inclined to sell a textbook back at the end of a semester. 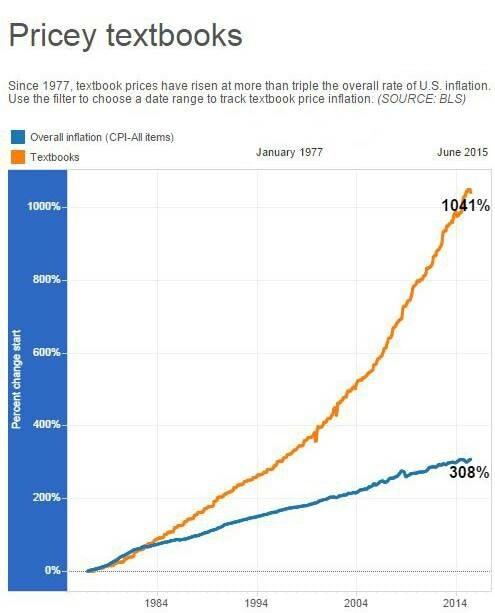 Rising textbook prices are also responsible for the rise of the open source textbook movement, which seeks to replace expensive college and K-12 textbooks with freely licensed versions that can be edited to suit the needs of a specific school or class. Would be interesting if someone would sue the US claiming the higher education system is a human rights violation. “a number of countries have now surpassed the U.S. in the percentage of younger adults with a tertiary attainment. The U.S. ranks 14th among 37 OECD and G20 countries in the percentage of 25-34 year-olds with higher education, at 42% -above the OECD average (38%), but far behind the leader, Korea (65%). Although overall tertiary attainment levels in the U.S. have been high for many years and remain well above the OECD average (30%), they are growing at a below-average rate compared to other OECD and G20 countries. For example, between 2000 and 2010, tertiary attainment in the U.S. grew anaverage of 1.3 percentage points a year, compared to 3.7 percentage points annually for OECD countries overall. You can also see the difference when it comes to low income students. Anyway, the US is going forward but a lot slower than others so it’s falling behind. China is also an interesting topic, urbanization is only some 55% vs some 80% in the US and higher education as a % was low while the population is old. Still China is pushing hard and they have some 7.5 million graduates a year now, so China is surpassing the US in total number even if it’s far behind in %. They also got a lot of room to grow as the population shrinks, urbanization continues and higher education gains even more traction. The saddest part is that pretty much everything is going downhill in the US as politicians lose any trace of honesty. Pick any domain and the stats will show things are not ok.